The Redding is on Sale! | Was $78,026 | NOW: $60,037! 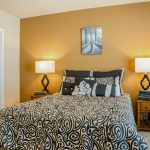 The Redding model has 3 Beds and 2 Baths. 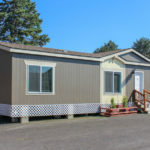 This 1279 square foot Double Wide home is available for delivery in Washington, Oregon, Idaho. The leisurely Redding model was made for entertaining. The open kitchen adjoins with the living room and dining area for a relaxed and laidback feel, ensuring maximum socialization between household members and guests. 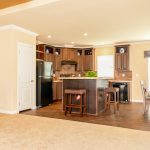 At the heart of it all is the centrally located kitchen island, which is big enough to accommodate several bar stools or chairs. The island is available in four alternative shapes and orientations. Redding exterior features a standard dormer, standard uniform large windows on the front door side, and 3 exterior paint colors. The exterior colors showing are Griffen (body), Barcelona Beige (trim), ad Banana Cream (accent). 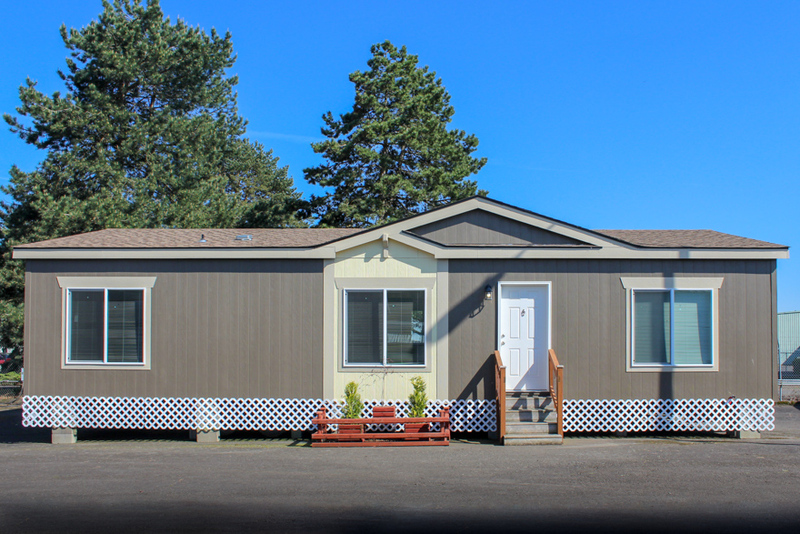 This model includes 8′-1/2″ high flat ceilings with a standard recessed tray ceiling in the living room. The interior paint is Croissant with cardboard paint as the accent color in the tray ceiling. 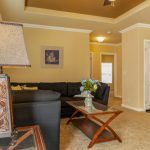 The ceiling crown molding and baseboard molding in the living room are an option. This home is standard with wire and brace for a ceiling fan in the living room, but the fan itself is an option. The carpet color is Mantra – Hemp. The cornice board over the window is a standard feature and the mini blinds are an option in this model. 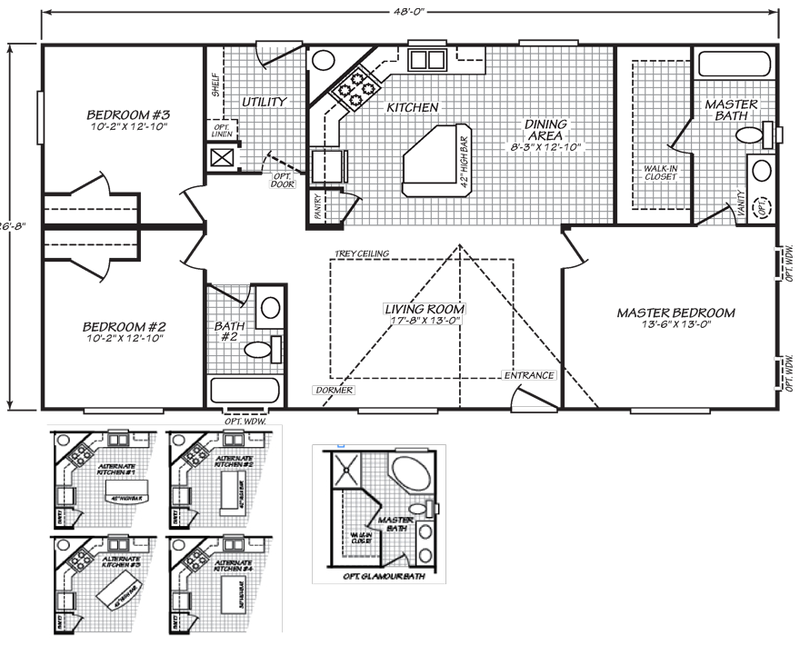 This model includes 8′-1/2″ high flat ceilings with a standard recessed tray ceiling in the living room. The interior paint is Croissant with cardboard paint as the accent color in the tray ceiling. 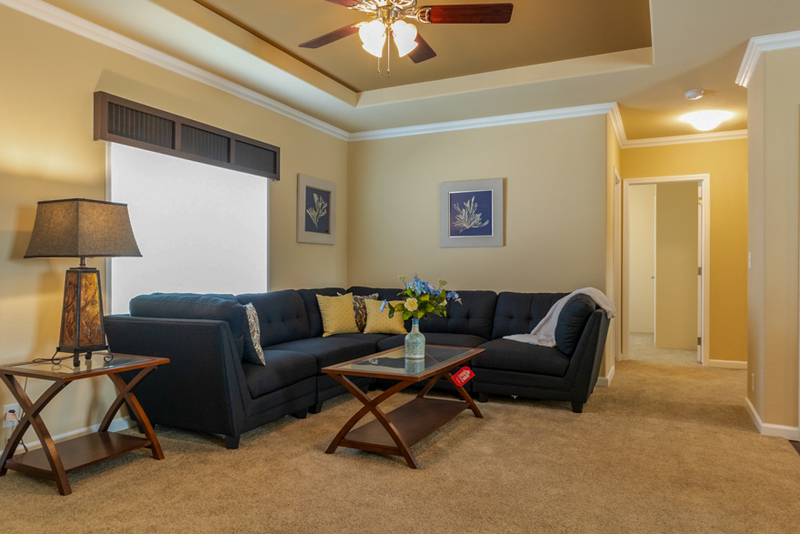 The ceiling crown molding and baseboard molding in the living room are an option. 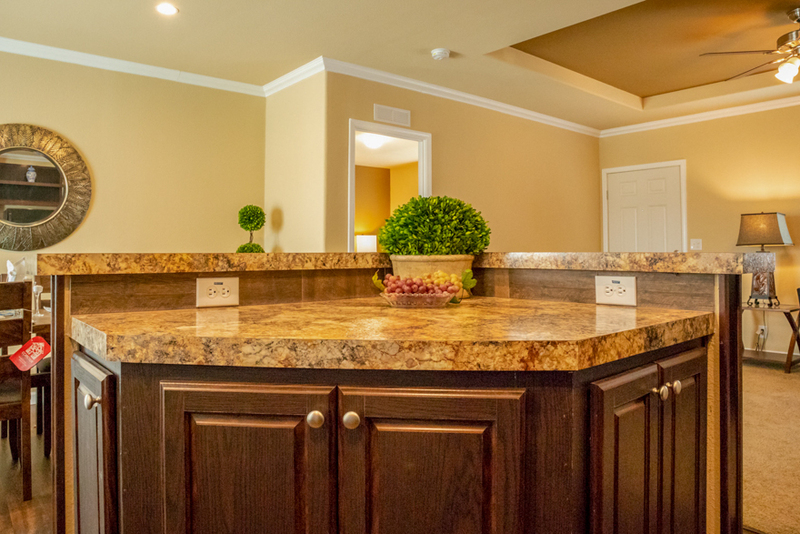 The crown molding and 3-1/4″ baseboard molding area also optional in the kitchen and dining room. This home is standard with wire and brace for a ceiling fan in the living room, but the fan itself is an option. The carpet color is Mantra – Hemp and the linoleum color is no longer available. Valley Oak is a similar linoleum color to the linoleum shown. 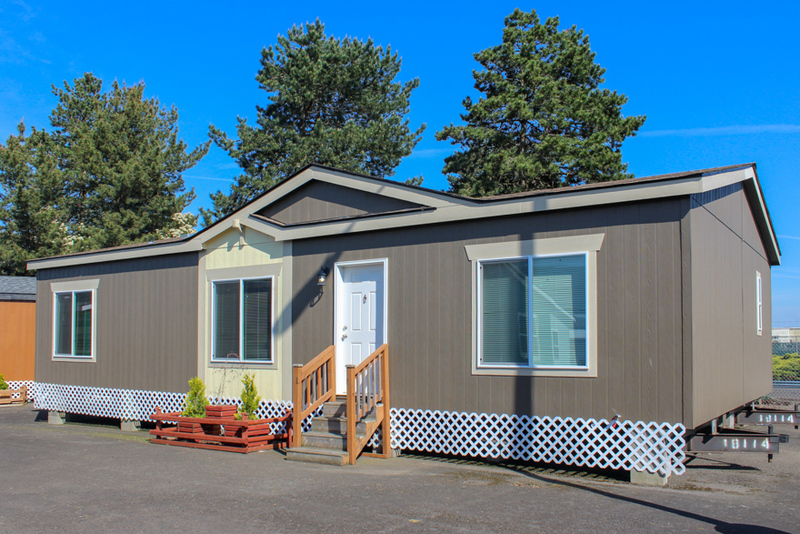 This model includes 8′-1/2″ high flat ceilings with a standard recessed tray ceiling in the living room. The interior paint is Croissant with cardboard paint as the accent color in the tray ceiling. 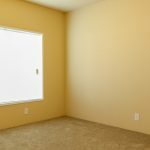 The ceiling crown molding and baseboard molding in the living room are an option. The crown molding and 3-1/4″ baseboard molding area also optional in the kitchen and dining room. This home is standard with wire and brace for a ceiling fan in the living room, but the fan itself is an option. The carpet color is Mantra – Hemp and the linoleum color is no longer available. Valley Oak is a similar linoleum color to the linoleum shown. Tape and textured walls with rounded corners are a standard feature. The espresso wrap cabinets are standard with tall overheads with cubbies. The cornice board over the dining room window is a standard feature. LED recessed lights are standard in the kitchen and dining room. The rangehood canopy is no longer available. A black Whirlpool refrigerator and range are standard. The dishwasher is an option. Full ceramic tile backsplash in the kitchen is an upgrade to the standard formica backsplash. 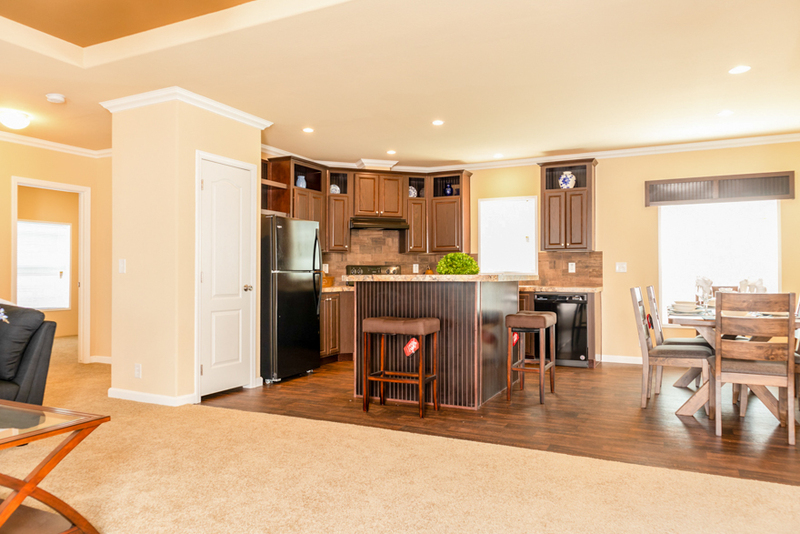 The Redding kitchen includes a standard kitchen island with a raised bar. Espresso wrapped cabinets are standard in this model, with tall overhead cabinets with cubbies as shown. The range hood canopy over is no longer available. Full ceramic tile backsplash is an upgrade to the standard formica backplash. A black Whirlpool refrigerator and range are standard and the dishwasher is an option. The linoleum is no longer available, however, Valley Oak is a similar color that is available. LED recessed can lights are standard in the kitchen. The countertop color is Salvage plank elm and the ceramic tile color is Taberna Stout. The ceiling crown molding is an upgrade. The Redding master bedroom includes a standard 62×59 window with a cornice board. The mini blind is an option. The main interior paint is Croissant with an accent wall painted the color Cardboard. The ceiling is showing a thin trim piece, but now comes with a finished textured corner at the ceiling. Carpet color is Mantra – Hemp. The bedroom ceiling light is a standard feature in this model. 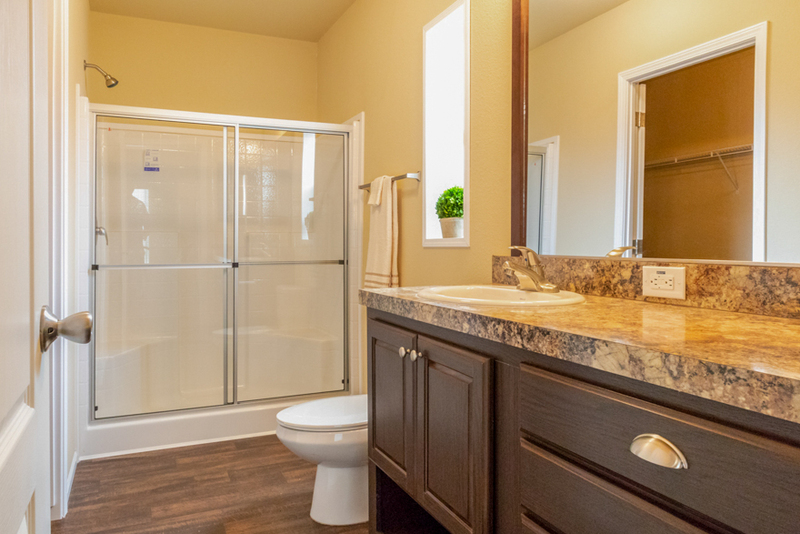 Master bathroom is showing the Easy Upgrade Master Bathrom Package #2, which includes a 60″ Shower, Elongated Toilet, China Sink, Single Lever Faucet, and a Medicine Cabinet (not shown). The interior paint is croissant. 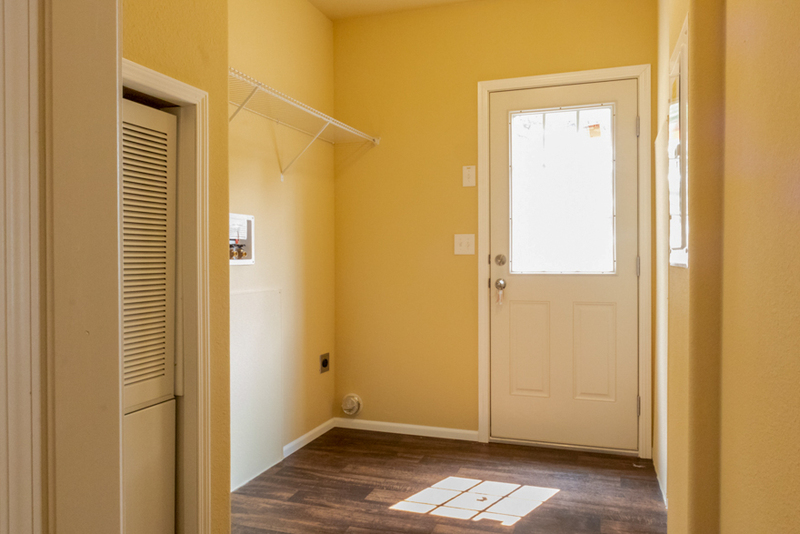 The linoleum is no longer available, but Valley Oak is a similar color. The cabinet is espresso wrap with salvage plank elm as the countertop color choice. The ceiling is showing a trim piece which is no longer there. Now the ceiling corners are finished with texture. Guest bathroom is showing the Easy Upgrade Guest Bathroom Package, which includes a 60″ 1-Piece fiberglass tub/shower, Elongated Toilet, China Sink, Single Lever Faucet, and Medicine Cabinet (not shown). The paint color is Croissant. The cabinet is espresso wrap with salvage plank elm as the countertop color choice. The ceiling is showing a trim piece which is no longer there. Now the ceiling corners are finished with texture. 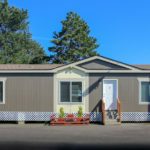 Guest Bedroom includes a standard 62″x59″ window, which has an optional mini blind. The bedroom ceiling light is a standard feature. 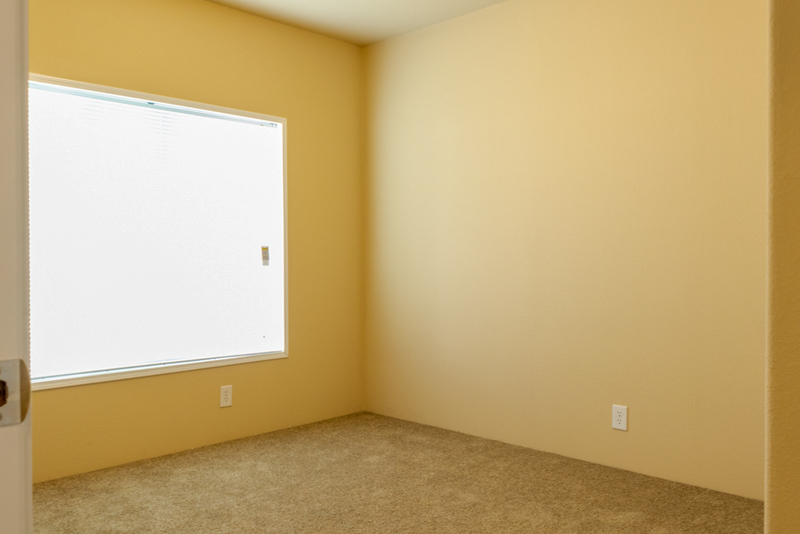 The interior paint color is Croissant and the carpet color is Mantra – Hemp. Redding exterior features a standard dormer, standard uniform large windows on the front door side, and 3 exterior paint colors. The exterior colors showing are Griffen (body), Barcelona Beige (trim), ad Banana Cream (accent) with Earthtone Cedar Shingles. 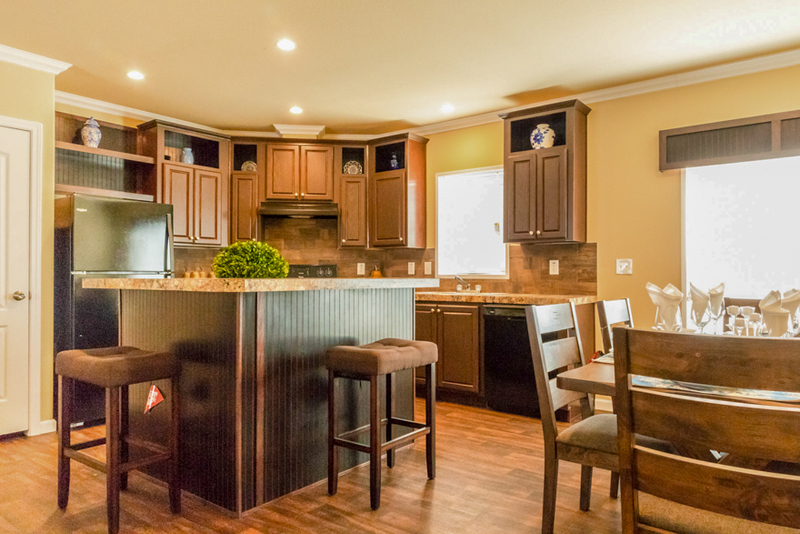 The Redding kitchen includes a standard kitchen island with a raised bar. Espresso wrapped cabinets are standard in this model, with tall overhead cabinets with cubbies as shown. Full ceramic tile backsplash is an upgrade to the standard formica backplash. A black Whirlpool refrigerator and range are standard and the dishwasher is an option. The linoleum is no longer available, however, Valley Oak is a similar color that is available. LED recessed can lights are standard in the kitchen. The countertop color is Golden Mascarello and the ceramic tile color is Taberna Stout. Golden Mascarello is an upgrade formica color. 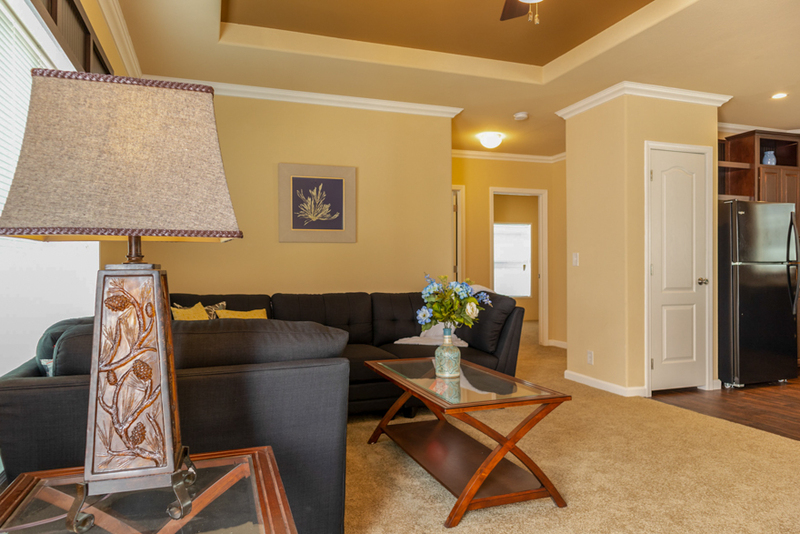 The ceiling crown molding and is an option and the 3-1/4″ baseboard molding is an upgrade. 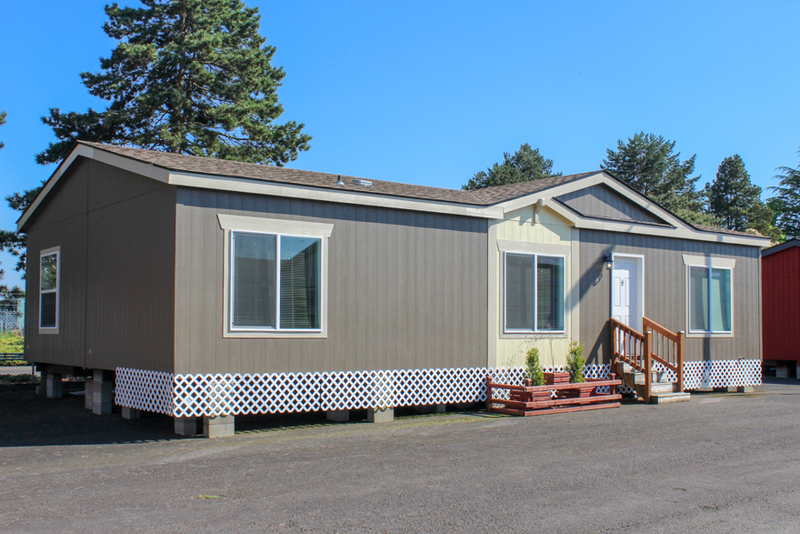 This model includes 8′-1/2″ high flat ceilings with a standard recessed tray ceiling in the living room. The interior paint is Croissant with cardboard paint as the accent color in the tray ceiling. 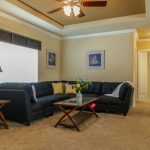 The ceiling crown molding and baseboard molding in the living room are an option. This home is standard with wire and brace for a ceiling fan in the living room, but the fan itself is an option. The carpet color is Mantra – Hemp. The cornice board over the window is a standard feature and the mini blinds are an option in this model. The countertop color is Golden Mascarallo, with is an upgrade, with optional Taberna Stout backsplash. 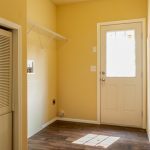 The dining room is showing optional crown molding and upgrade 3-1/4″ baseboard molding. The interior walls are painted Croissant. The two LED recessed lights are a standard feature. The linoleum color is no longer available, however, Valley Oak is a similar color that is avaialble. The standard window showing is 46″x59″ and includes a standard cornice board. The mini blind is optional. The main interior paint is Croissant with an accent wall painted the color Cardboard. The ceiling is showing a thin trim piece, but now comes with a finished textured corner at the ceiling. Carpet color is Mantra – Hemp. 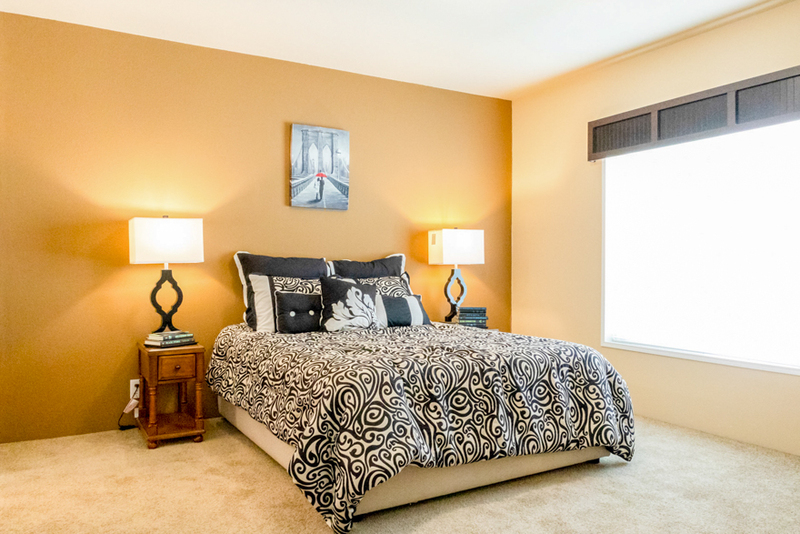 The bedroom ceiling light is a standard feature in this model. 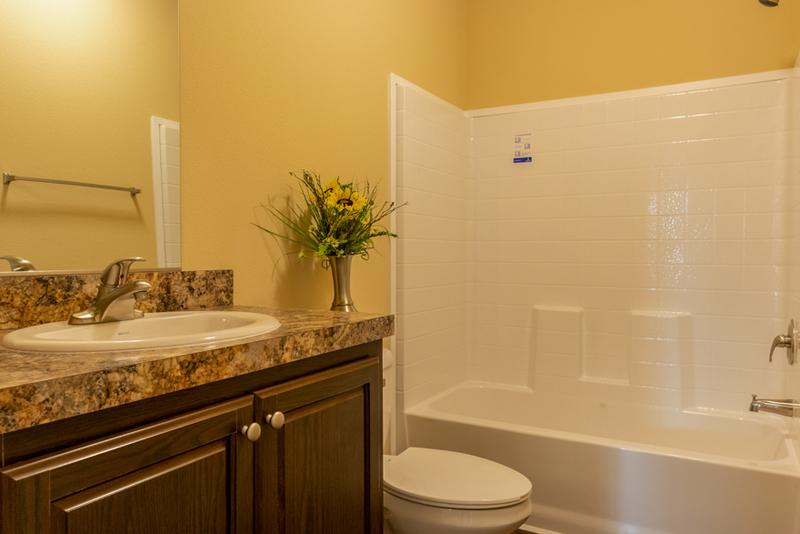 The master bedroom has its own bathroom with the walk in closet located in the bathroom. 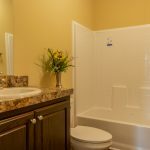 Master bathroom is showing the Easy Upgrade Master Bathrom Package #2, which includes a 60″ Shower (not shown), Elongated Toilet, China Sink, Single Lever Faucet, and a Medicine Cabinet. The bank of drawers in an option. The interior paint is croissant. The linoleum is no longer available, but Valley Oak is a similar color. The cabinet is espresso wrap with salvage plank elm as the countertop color choice. Kitchen island is showing upgrade Golden Mascarello countertops and upgrade Taberna Stout ceramic tile backplash. The ceiling crown molding is optional. The interior paint color is Croissant and the recessed tray ceiling has Cardboard accent paint color. The Redding master bedroom includes a standard 62×59 window with a cornice board. The mini blind is an option. The main interior paint is Croissant with an accent wall painted the color Cardboard. Carpet color is Mantra – Hemp. 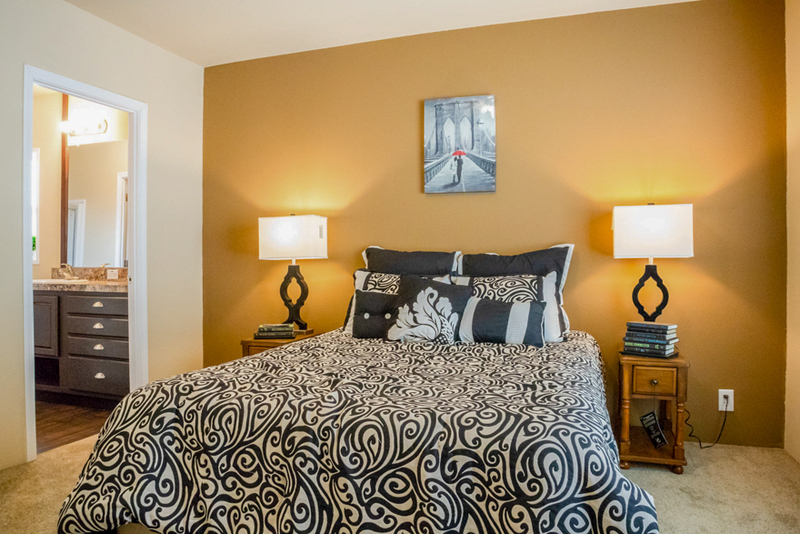 The bedroom ceiling light is a standard feature in this model. 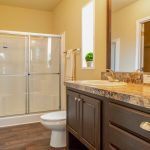 Master bathroom is showing the Easy Upgrade Master Bathrom Package #2, which includes a 60″ Shower, Elongated Toilet, China Sink, Single Lever Faucet, and a Medicine Cabinet (not shown). The interior paint is croissant. The linoleum is no longer available, but Valley Oak is a similar color. The cabinet is espresso wrap with salvage plank elm as the countertop color choice. The window over the toilet is standard and the bank of drawers is an option. Guest bathroom is showing the Easy Upgrade Guest Bathroom Package, which includes a 60″ 1-Piece fiberglass tub/shower, Elongated Toilet, China Sink, Single Lever Faucet, and Medicine Cabinet (not shown). The paint color is Croissant. 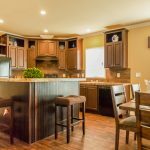 The cabinet is espresso wrap with Golden Mascarello as the countertop color choice. 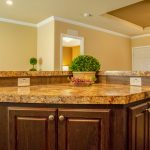 Golden Mascarello is an upgrade countertop color. Utility room showing the upgrade 9-Lite back door. Home includes an electric furnace, 50 gallon water heater, and hookups for a side by side washer and dryer. Interior wall color is Croissant and the linoleum is no longer available, however, Valley Oak is a similar color that is available. 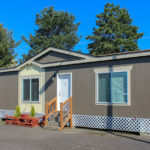 Ask your housing consultant about the other great features that come standard on the Redding manufactured home.